Mobility is an enormously important part of Crossfit and is essential for maximising your own performance and movements. Mobility has always been underestimated in many sports, but it is a crucial part of any dedicated Crossfitter’s training. It helps you move your limbs through their full range of motion and as well as eliminating restrictions, it also improves your ability to reach optimal positioning during movements. With a little help from OUR FRIENDS such as foam rollers, rubber bands and Lacrosse balls, great things can be achieved. Most of you probably already know all the ‘standard’ exercises such as couch stretch or shoulder extensions, but only a few might have really dived deeper into the topic of mobility (unless you’ve had some serious problems / injuries and sought professional help). The following mobility exercises will help you to prevent injury, or – in case that train has already left the station – assist in getting rid of your problems / injuries. Handling a lot of pressure and strain often causes the shoulders to become one of the most common ‘problem zones’ for all Crossfitters. Fortunately there are some great ways to mobilise your shoulders and minimise shoulder pain, reducing the risks of injuries and improving your overall performance. When it comes to exercises with over head positions, such as Overhead Squats and Snatches, many Crossfitters face problems. Because of weak shoulder mobility rotation they struggle to catch and/or balance the bar properly. One way to improve your Crossfit mobility is a partner mobility exercise using a lacrosse ball which only takes 3-4 min. Start this exercise with your weaker shoulder, the one which has less mobility. Lay down on your back and let your partner place the lacrosse ball just below the shoulder blade of the arm you want to mobilize. Your arm lies next to your body and your partner will raise it slowly for you. Now you can feel the shoulder blade sliding along the ball. If a position is reached where it hurts then stop immediately! To loosen up your muscles, your partner needs to move your arm slowly and in small steps backwards and forwards. Move like that until you reach your over head position (your arm is now straight up and lies next to your head). Your shoulder blade will reach a maximum of rotation by putting more careful pressure on your arm. Keep that position for 20-30 sec and then switch to the other shoulder. The exercise shouldn’t take longer than 2 min for each side. For this exercise, lay down on your back and cross your arms behind your back just above your buttocks. Angle your legs and raise the hips, as seen in the picture below. In that position your shoulder blades are rotated inwards with your shoulders flat on the ground. When you are in the right position, your partner places his hands on your shoulders, keeping them on the floor while you lower the hip slowly. The pressure of your partner is necessary otherwise your shoulders would move towards each other and leave the floor. At best, your hips will rest on the floor and your shoulders will still be positioned on the ground due to the weight/pressure/help of your partner. Hold that position for 30 sec and repeat it twice. The whole exercise shouldn’t take longer than 90 sec for one repetition. 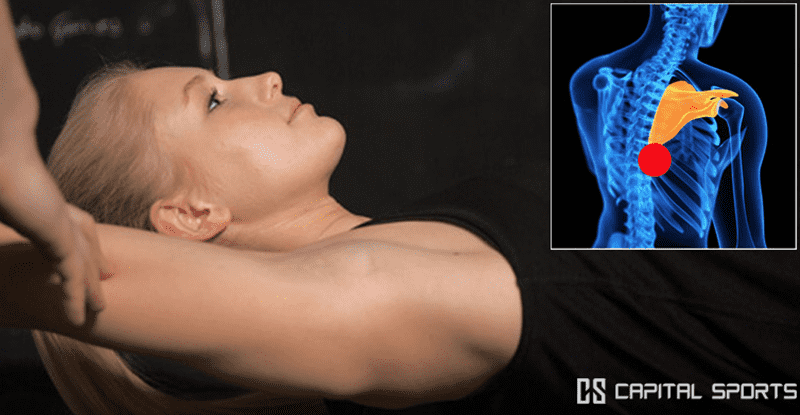 These two exercises will help to improve your range of movement, decrease shoulder pain and increase your range of motion and drive you forward towards achieving new PRs! For more mobility tutorials and further instruction content dare to follow us on Facebook and Instagram.